Yellowstone National Park (YNP): The northern Gallatin Range is the largest remaining still unprotected roadless wildland adjacent to Yellowstone, the world's first national park. The Southern Gallatins are within the park, but the entire contiguous half million plus acre wildland needs to be protected in order to help sustain the biological integrity of the Yellowstone Ecosystem. According to conservation biologists, YNP's plethora of wildlife would falter without adjacent protected national forest lands. The Absaroka-Beartooth, North Absaroka, Washakie, Teton, Jed Smith, Winnegar Hole and Lee Metcalf Wilderness Areas effectively enlarge the Yellowstone backcountry so that many species that are rare or extinct elsewhere, including large carnivores, can thrive within the magnificent Greater Yellowstone. Indeed, without these protected wildlands, the Yellowstone region would be an impoverished fragment of what thrives today. The wild northern Gallatins are the major missing link of this otherwise protected realm. Wildlife: The Gallatin Range is one of America's best wildlife areas. Grizzly, black bear, gray wolf, wolverine, marten, badger, porcupine, mountain lion, elk, moose, mule and whitetail deer, bighorn sheep, bison, mountain goats and more are unbelievably profuse here. Lynx is a listed Endangered species. Summer and winter range plus, migratory routes for part of the world-renowned Northern Yellowstone Elk Herd are here. Bald and golden eagles are frequently seen, along with peregrine falcons, northern pygmy owls and many other birds of the prairies, coniferous forests and tundra. Rich fisheries support cutthroat trout and other game fish. This incomparably diverse and abundant mix of wildlife brings a palpable and overwhelming life force to this primitive landscape. Hunting: The Northern Gallatins are a hunting mecca; the big bucks and bulls thrive in the cover and topographic folds of the backcountry. Wilderness designation will protect the kind of remote hunting and fishing experience that's becoming rare in this increasingly crowded and hemmed-in world. 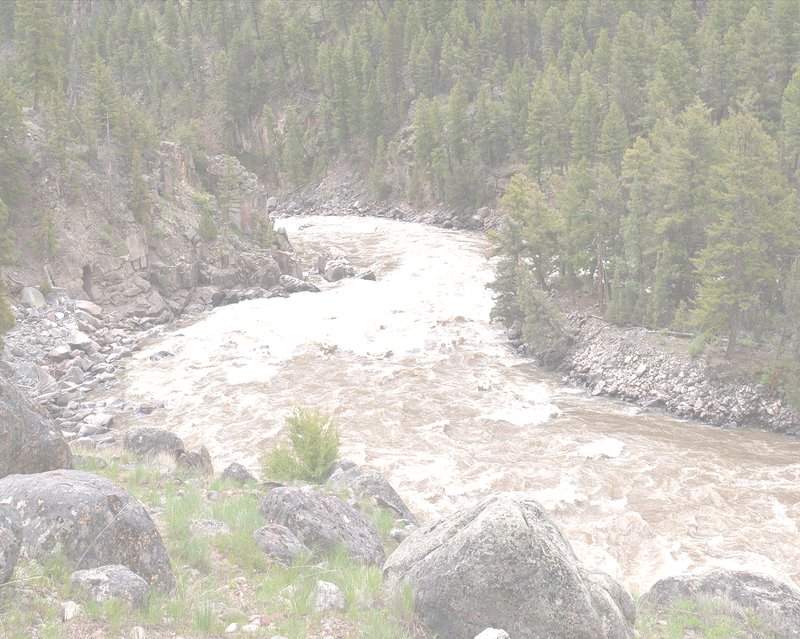 Fishing: Two blue ribbon trout rivers - the Yellowstone and the Gallatin -- that depend upon the clear, cold water emanating from the high country bound the Gallatins. Protecting these watersheds is a priority. Our elected officials must understand that any detriment to the fishing quality is unacceptable. Yellowstone cutthroat trout and Arctic grayling both thrive in the Gallatins, and Wilderness designation would help to ensure their survival. Water: The Gallatin crest collects an average of 300 inches of snow. This snow pack melts slowly, nourishing an abundance of clean cold mountain streams, lakes and wetlands, and beautiful vegetation. Trickles and rivulets of snowmelt, spring rains and summer thunderstorms coalesce into the headwater magic of some of our nation's greatest rivers. Petrified Forest: The 25,980 acre Gallatin Petrified Forest is within the 200,000 acre North Gallatin Range Roadless Area. This is the world's most extensive fossil forest, with 30 million year old stumps of ancient sequoias buried by Eocene lava flows, still anchored and upright atop these wild ridges. Unfortunately, vandalism and theft of specimens are rampant, facilitated by the increasing armies of motorcycles and ATV's that now defile the wildlands. Wilderness designation under the Wilderness Act of 1964 will help to protect this priceless heritage. Economy: Hunting, fishing, backpacking, horse packing, cross country skiing, bird watching and other wildland activities pump hundreds of millions of dollars into Montana restaurants, lodges, stores, gas stations and other businesses including outfitting and guiding. In 1995, Montana hunters and anglers alone dropped over 325 million dollars and spent another 428 million on license fees. Numerous studies and indisputable examples show that healthy wildlands foster vibrant and diverse human economies. Our economy cannot be repaired if we lose the anchor that holds it in place. It's up to us!